Arrived in Popayan after an overnight bus from Bogota; quick breakfast, then a bus to Pasto. By the time we got there in the late afternoon we’d been travelling nearly 24 hrs…. Up in the morning for a bus to the border, then a colectivo to Tulcan & a bus to Quito – arrived there early evening. Another whole day of travelling… looking forward to a few days in one place. Tracey had fortunately booked a nice hostel (Tambuca) smack bang in the middle of all the Galapagos tour firms – a day was spent checking out all the firms for the best offers. Received an amazing offer on an 8 day cruise on a 1st class boat leaving tomorrow, but sadly too expensive :(, I guess we have another day of office visits tomorrow… I am not sure why I am disappointed, I have already done an 8 day cruise on a posh boat; and after all, how many times do I actually need to go to the Galapagos? Last night’s nice meal has left me a bit crook this morning; in the day of finalising the trip to the Galapagos. Tracey has refined in down to 3 options – one going tomorrow, one going Sun & one going Mon. All are within a couple of hundred dollars of each other but with different itineraries. I think that T wants anyone apart from the tour starting Sat as she has her heart set on going to the huge all day market in Otovalo… unfortunately we end up choosing that one (huge shame…!) & have to run around buying the flights & extracting huge fortunes in cash from the bank to pay for it. This only leaves a small amount of time to see Quito proper & buy in supplies (crisps & rice cakes). Finally chose the boat (last 2 spots) and then spent the rest of the afternoon trying to book the flight to go with the trip, sadly meaning that not only am I going to miss Otavalo market, but also the cable car and the inside of the Compania de Jesus church; AND we are returning to Guayaquil so no Mindo or Cotopaxi either – I will have to come back to Ecuador, clearly. Keir took me on a whistle-stop last minute tour of Quito, then we cabbed it to the big supermarket where I managed to find rice cakes AND lovely dark chocolate, ate some immediately despite the imminence of dinner, yum. Dinner at Fried Bananas, or maybe it was Platanos Fritos… – fantastic food and G&T, the quesillo with honey was fabulous. 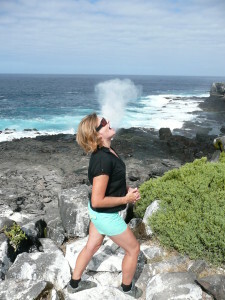 We are quickly into the tour & seeing giant tortoises & walking through lava tunnels (or in my case sliding on my arse!). T obviously couldn’t resist the photo opportunity in the dead tortoise shell… quelle surprise! I am starting to wonder if I will be capable of a lie in ever again, maybe this is what happens to other people… Anyway, off to the airport with a couple of nice Canarians, waited in the wrong queue for 30 minutes before realising we had to go through pre-check in check in first, but made the plane finally! The yacht moved overnight whilst we slept (well, some of us slept…I’m sure T will have something to say about that!) to Floreana. A day of seeing birds, boobies (of the ‘blue footed’ kind unfortunately! ), more lava tunnels & some rays mating. There’s a tradition of posting some cards in an old barrel of a post box for other travellers to pick up & deliver. We took some to deliver in Argentina & Australia as the UK would have taken too long. Then it was time in get in ill-fitting wet suits & snorkel around the Devil’s crown – really cool – not so much in the fish & rays we saw but swimming with turtles & more amazingly sea lions…. You can keep the rest; these babies are the fun ones to play with. 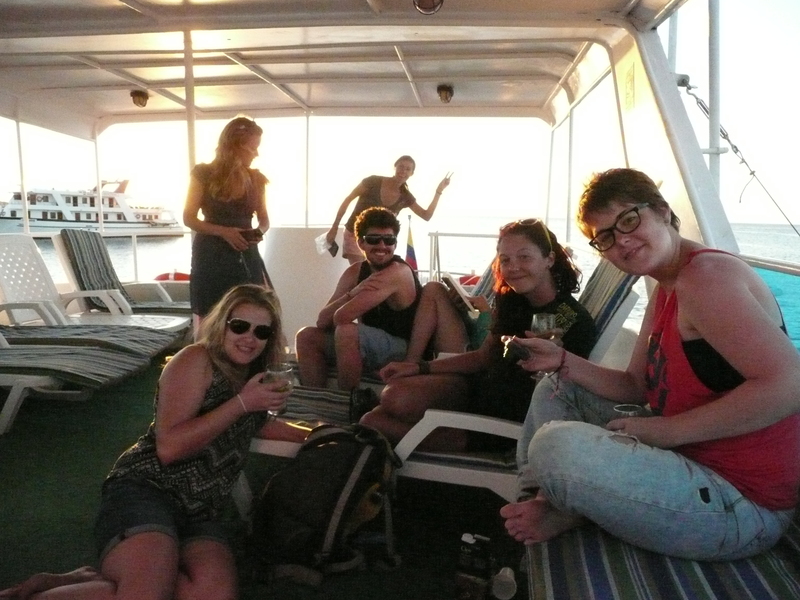 In celebration we went through quite a few caipirinhas at sundowners & muchos bonding was done that night! Floreana today, the highlights of which were seeing a penguin (albeit in the sea and looking like a duck) and some snorkelling – lovely, but I do not remember it being this cold when I went in September! I also acheived the astonishing feat of losing my snorkel before we even started… Keir very kindly gave me his. Due to the female heavy crew there were many wetsuit fit issues, poor Charlotte and Sandra had to double upon men’s suits and Fiona miraculously squeezed into a Thai size medium, basically the right size for a 12 year old. Since the volume of food is truly enormous, and I have little self-control, I was glad that I managed to score a European Medium. Another night move & we wake up in Espanola. A day of birds, iguanas, sea lions snoozing on the beach & some more snorkelling (T’s freezing again & goes as blue as the boobies). An afternoon cruise to San Cristobal & an offer of an evening ashore… T & I elect to crash out at 8 in our bunks… we must be getting old! Ah, Espanola was one of my favourite islands, I had forgotten how beautiful it was. A morning of walking about San Cristobal & seeing the interpretation centre – I could have missed this one. But the afternoon was snorkelling again off Isla Lobos… best time yet… we saw the usual turtles & fish but had an amazing time following marine iguanas swimming & then playing with sea lions. The latter are so agile & poetic in water that it’s like watching a marine ballet. The highlight was watching 2 sea lions chasing iguana’s underwater, nipping their tails & generally just toying with them. The morning sees us waking in Santa Fe. A morning hike saw more iguanas – yellow this time – then time for the final snorkel. Rewarded with the sight of a white tipped reef shark – very cool & fortunately only about 5’ long! The afternoon was spent trekking on Plaza Sur which rose up to a cliff-face packed with birdlife. Albatrosses & frigate birds glided across the skies whilst tropic birds darted around trailing long white streamer-like tails behind them. A fairly boozy night for the group rounded off a lovely trip. Damn, I missed the shark too, what the hell was I doing? Woke up early for the last trip; a dinghy ride around Caleta Tortuga Negra – a hidden mangrove swamp. A morning of rays, leaping sharks, sleeping sharks, turtles & lots of birds – a fitting end to our stay. It reminded me heavily of the Farne Isles off Northumbria – apart from the weather of course! The highlights were all underwater – in my case watching the sea lions chase iguanas. Disappointingly no Blue Footed Booby feeding time today, not sure if it is the wrong season, or we arrived too late, but it was cool seeing the sharks and baby rays. Managed to change our flight for an earlier one and arrived about 3pm in Guayaquil for some frantic, yet failed, attempts to arrange whale watching tomorrow. Too long and too expensive; decided to leave tomorrow and spend an extra night in Baños instead. At last, a lie in after an evening of trying to organise a whale watching trip. Eventually we decided that it would take longer to get to the whales than to actually see them. So a quick reshuffle of plans & we were off to Baños. Arrived in the evening & had a lovely meal at the Hood café where Tracey was eyeing up their book exchange longingly. Great food in the ‘hood deciding what new, random activities we could try tomorrow. I am STILL looking for the Girl with the Dragon Tattoo or The Hunger Games in Spanish – surely someone has them! Wow – Baños is beautiful – a green paradise surrounded by vertical mountains. We can actually see a waterfall just out the back of our hotel. 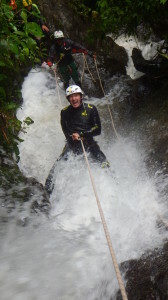 Organised canyoning (absailing & sliding down waterfalls) & ziplining for the following day & hired bikes for the afternoon. Things were going great, we’d seen a couple of waterfalls & caught a small ‘cage’ cable car across a chasm already, when Tracey decided to do a ‘superman’ over the handle bars of her bike! Amazingly she survived with a few bruises & hurt pride but not any major damage. We took refuge in a café when the heavens opened & decided to call it a day & catch a bus back; whilst she put on a brave face, I could see that T wasn’t too keen on riding in wet conditions. As soon as we dropped the bikes off, the rain obviously stopped & the sun poured through instead. Ok. So today I learned that not only should one never use the front brakes when going downhill, but that it was also inadvisable whilst cycling over water – fortunately I was not in the road for this one. After thoroughly soaking myself, crying briefly, and limping around a bit, I tried to redeem myself by getting back on the bike (in a drier spot) and cycling to the next waterfall. I t’s raining outside & we’re off to play in waterfalls for a few hours – deep joy, combining the 2 things I’m not great with – water & heights. It actually was good fun, climbing down canyons then abseiling down through waterfalls. T was a trooper – even with all her bruises & being freezing cold. We even managed n almost vertical zip line down one waterfall. The afternoon’s zip lining was cancelled due to the wet weather – neither we nor the instructors were too keen on doing it in the rain. We could have easily stayed in Baños longer, but that night saw us taking the overnight bus towards Lago Agrio & an Amazon adventure! After 4 buses (including a missed bus stop), 16 hrs & a further 3 hour boat trip we arrived in Samona Lodge, deep in the Ecuadorian rainforest. We were straight out on a boat trip heading down river – heard a lot of birds but didn’t see much. Despite my reservations about any trip advertising itself with tarantula pictures, I found myself on a boat with one. It may not have been so bad if the little scrote of a boy didn’t keep ripping its shade off and generally goading it into movement, thus causing both Margot (who we bumped into again) and I to shriek wildly and stand up whilst the boat was moving, narrowly avoiding both a capsizement and a spider attack, before finally reaching the lodge. Day 2 in the Jungle – No sign of Ant & Dec fortunately, but off on a day march through the jungle followed by a paddle in the canoe back. I was lucky enough to see Great Otters – they disappeared when they heard the rest of the group arriving – & we saw a multitude of spiders, ants & other insects. The infamous night march saw a whole multitude of scary insects & spiders (lobster cricket & scorpion spiders being amongst the scariest). The lodge itself hosted its own menagerie of creepy crawlies (cockroaches & tarantulas) & scary monsters (a 4’ Caiman lived under the huts)! 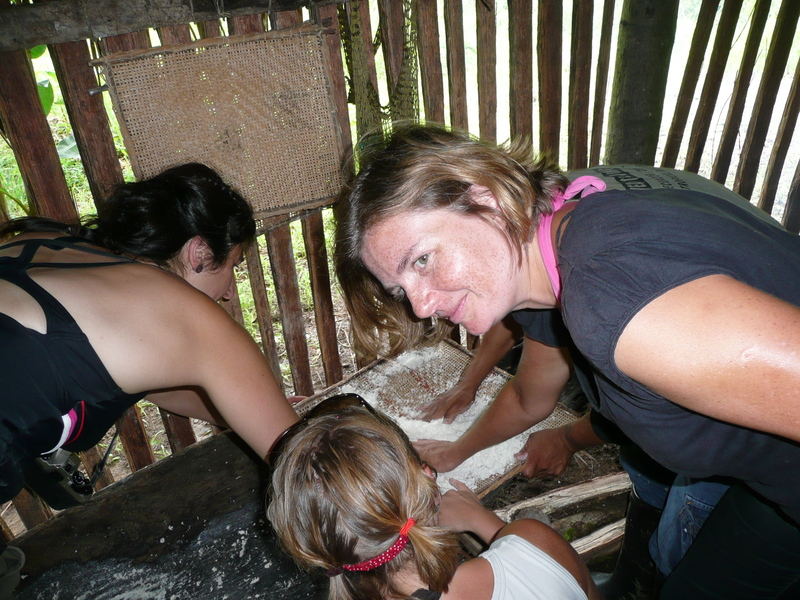 Day 3 in the jungle – A long trip down river to see the local shaman & make yuca bread – T was most interested in the latter! On the way back we were lucky enough (if that’s the right word to use!) to see 2 Anacondas basking in the trees – one baby & a big muther… that is the right word to use! By now we were used to hearing the famous words of Ron our guide – “Just stop, be quiet & listen to the music of the jungle”. That usually meant that again there weren’t any birds to see & we’d just have to listen to them instead! The final day in the jungle saw us awake very early for a morning bird watching trip. The source of the previous night’s noise was found- something had eaten through 2 layers of plastic bags suspended from the ceiling & then the crisp packet itself to the salted crisps. Nothing else was touched in food bags – it must have been a most discerning of animal/ insect. We saw a few birds in the morning but the highlight was the pink-bellied river dolphin playing in the lagoon – absolutely beautiful watching them jumping & larking about. 0930 saw us catch the boat trip starting the long trek south through Ecuador towards Peru. Pink dolphins! This saved what was a fairly uneventful, yet spider-heavy, jungle outing. Interestingly enough, with the caiman under the kitchen, toads on the table, and tarantulas in the roof, there seemed to be more animals in the camp than in the jungle. 3 buses & 35 hrs later we arrived in Loja, Ecuador for an overnight stop before the next day travelling into Peru. After much searching for a restaurant (they often shut by 2000 through-out Central & South America) we found one & had had the biggest & best steak of the trip so far… roll on Argentina! 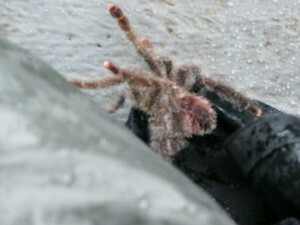 Ooh Tarantula! And so many fuzzy friends to keep you guys warm in the absence of Ant & Dec – eek! And Ms Tracey – best wishes for a very Happy Birthday m’dear !! Great to hear of your continuing adventures. ever been blogging for? you make blogging glance easy. The whole glance of your website is wonderful, let alone the content! Just for the trip. It’s great to be able to look back through it, but doing it every day was really hard work! Glad you liked it. Me love you Lao Lao!